Bocas del Toro is known for its rowdy nightlife and offers a range of bars and clubs that satisfy the needs of any type of partygoer. It’s a small town in one of the few small islands in northern Panama. Here are the top bars and clubs in Bocas del Toro, to help you get a taste of what it’s like to spend a few nights in a beach town that never sleeps. This bar in particular has funky beats, two pools in back, and even ladies night on Wednesdays, where ladies get free drinks. There is a large area for dancing and an open deck in the back, where the crowds tend to congregate when the weather is nice. There are two bars; one inside and one outside, which offer drink specials and beer throughout the night. There is available seating outside alongside the water, which is the perfect place to take a break from dancing and relax in the cool air. Have you ever ridden in a water taxi at 3 in the morning? In order to get to this bar, you have to take a water taxi from the main island, Isla Colon. Try not to fall out! I felt like I walked into a waterpark when I visited this bar. There are swings to jump off of and into the water in the back of the bar, and there is even a water trampoline. Aqua Lounge is also known for its themed parties, so get ready in your favorite costume for the chance to win free drinks all night. This bar has a lot of open space outside where a lot of people like to relax and look at Bocas del Toro from a different perspective. There are seating areas inside as well, where you can relax with a drink and take a break from dancing. Aqua lounge has a narrow deck surrounding these pools; at night these pools are part of the bar. Bring the coins! This bar offers Happy Hour from 8-9 p.m., which includes $.50- $.75 beers. They also take pride in their music, where they play anything from funky beats to classics to progressive music. Barco Hundido is known as the “Wreck Deck,” and has a sunken banana boat which is lit up at night, offering a unique view unlike any other bar in Bocas del Toro. This is also a popular spot for locals and tourists on the weekends. They open up multiple dance floors when it gets busy, which is perfect for those who don’t like cramped bars or clubs. You’ll find yourself shaking your hips and rocking out to anything from reggae, to hip-hop, to classics, all of which are played sporadically at this bar. This is the perfect place to start your night, meet up with friends, and enjoy a few drinks before heading to the crazier clubs. Tunga Bar is right in the middle of everything, which is why it’s quite convenient as a central meet up location. The DJ’s playlist includes dance and electronic music and the place has plenty of seating areas to accommodate the large nighttime crowd. They also offer free Wifi. Live like a local and party it up when you visit Bocas del Toro. It’s a great way to get an authentic feel for this great little island town. 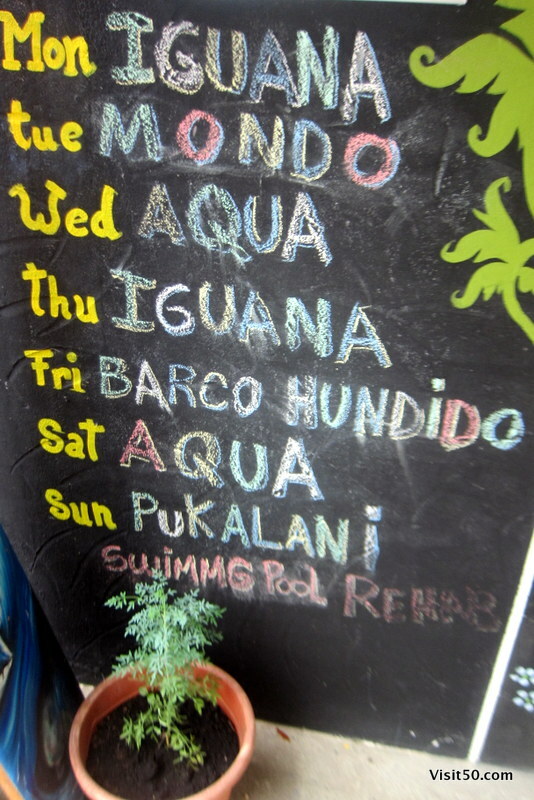 This guest post on Bocas del Toro nightlife was from Monica, who writes the awesome travel blog Globe Trottica. Check out the rest of her Panama trip and her other adventures around the world. Check out the rest of my Panama adventures, including a photo tour of Island Hopping in Bocas del Toro Panama – so much fun! Thanks guy, it was fun!